If lawn care chores are wearing you out, you might be trying too hard. Nurturing a Dallas landscape takes some effort, but why make it complicated? You can keep that yard perfectly happy with seven simple steps. 1. Understand the Grass – Just knowing what kind of turf you’re growing isn’t enough. Bermuda grass doesn’t like shade, and St. Augustine is a heavy drinker. Whether it’s buffalo, centipede or zoysia, show that lawn some love by learning about its preferences. 2. Watch Your Watering – Break the habit of watering on set days. Slow, deep soakings encourage healthy root systems, so wait until the yard looks a little thirsty. 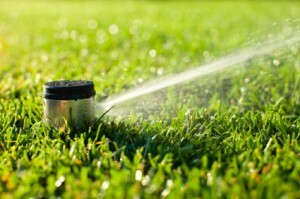 Whether you irrigate with a sprinkler or an automated system, water early in the morning for maximum effect. 3. Feed on Schedule – Most North Texas lawns like their nutrients served every two months from May through late September or early October. Cater to their tastes with slow-release fertilizers, and treat them to organic goodies left behind by a mulching mower. 4. Let It Breathe – Thatch buildup chokes off root systems and gets in the way of water and nutrient uptake. Give that grass breathing room with a thorough aeration every fall. The chore requires special equipment, so check with your Dallas lawn care professional. 5. Investigate Bad Patches – A healthy, green lawn with a few bad patches can turn into a landscaping disaster. Get out the trowel, poke around, and check that turf for signs of fungal disease or insect invasions. Never ignore grass that doesn’t look quite right. 6. Sample the Soil – It’s easy, and you only need to do it every two years. Texas A&M is a great resource for soil testing, so put your dirt in an envelope, and mail it off for an affordable soil report card. 7. Sharpen Your Blades – If you don’t take care of the lawn mower, you wind up ripping the grass instead of cutting it. Sharp blades make the job easier on you and the yard, so refresh their edges once a month. Invest in a plastic blade balancer that lets you reassemble the mower like a pro. We enjoy sharing lawn care tips with Dallas area homeowners, and we hope that these seven steps make your yard chores easier. If you want to eliminate your yard chores altogether, just give us a call. ABC Home & Commercial Services offers mowing, fertilization, weed control, insect & disease control, core aeration and watering for your lawn so you don’t have to worry about a thing. ABC is here for any needs you or your house might have. Whether you need pest control, lawn services, or commercial services - ABC is here for you!